April is my favorite time to visit Fort De Soto in St. Petersburg, Florida. 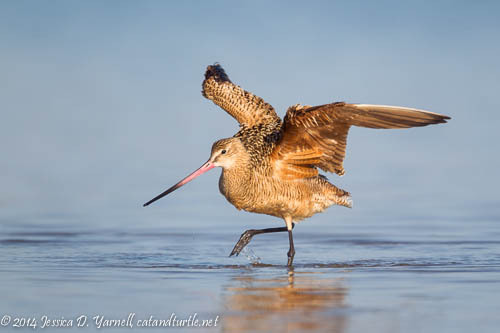 The sandy beaches are beautiful, the spring winds are cool, and my toes get to wiggle in the ocean water as I photograph the birds molting into their breeding plumage. An April visit always has the possibility of a fallout, where migratory birds are caught by rainstorms as they cross the Gulf of Mexico, so they land at the first opportunity – Fort De Soto! But even if it’s a slow day for migrants, the North Beach springtime bird photography opportunities are spectacular. 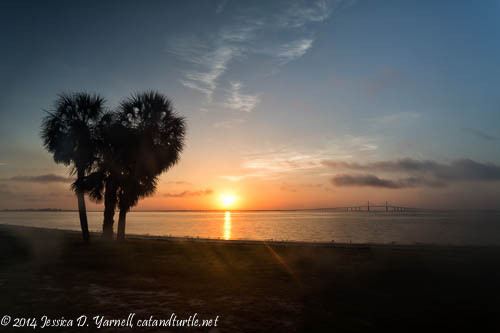 My husband thinks I’m nuts, but I love to start a good morning at Fort De Soto with a sunrise, even though that means getting up early enough to drive from Orlando and still arrive 30 minutes before sunrise. Yep, I’m crazy, but at least I’m not the only one. It was great seeing Michael, Donna, Susan, and Daniel at the park this morning. We all had the same problem with the sunrise – lens fog! My early shots were long exposures with my ND filter, but I didn’t move into position with the palm trees in the foreground until well after sunrise, when my lens fogged up and I didn’t realize it. Oh well, it’s a good reminder to check that next time! As I stood photographing the sunrise, a small flock of Canada Geese flew overhead. It’s the first time I’ve seen them in Florida. I moved to North Beach as the sun rose. North Beach at sunrise is easily one of my favorite places to photograph in Florida. The light is wonderful! 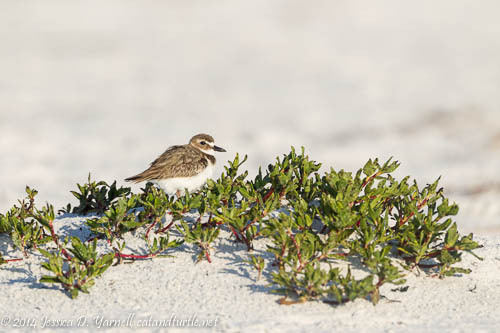 My first birds were some Wilson’s Plovers, who posed in their characteristic habitat as I asked them to please start nesting and put their eggs in good photogenic spots! :) It was a pleasure to meet some other birders/photographers, who gave me some advice about where to find Snowy Plovers in Florida. I’ve now seen the Piping Plovers, but I’ve yet to see a Snowy. Yet! There were lots of Red-breasted Mergansers that morning, and they were so tame! I waded into the water to get on the good side of the light. 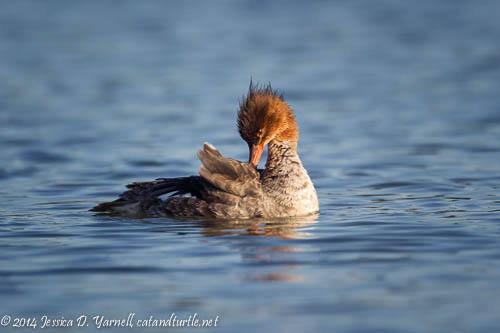 It amazed me when the mergansers swan right up to me, as if they didn’t care a bit that I was there. The Beast was too much lens. It’s always great when you put the camera down and gaze in awe at the birds around you. 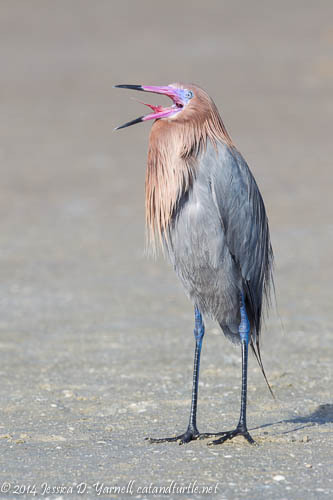 Reddish Egret with Tongue Out! The Reddish Egret wasn’t the only show-off. A nice flock of Black Skimmers rested along the beach, and a couple of Marbled Godwits went fishing in the great morning light. I was debating wading into deeper waters to get the godwit, when he decided to move closer to me and do a nice wing-flap! Sometimes birds cooperate so nicely for the camera. 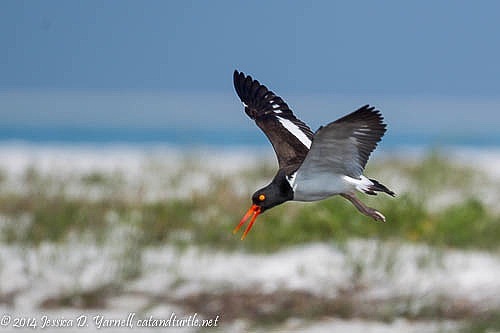 A pair of American Oystercatchers fed right in front of me. I got down really low and got some great shots of the birds calling, but when I looked at the pictures, I realized that I was so low that I couldn’t see their feet! The background was gorgeous but foot-less birds look pretty funny. So instead I’ll post this fly-in shot. This was right before the birds teased me. We’d been watching them do some courtship rituals, and we begged them to do a piggy-back ride for us. (OK, it’s not exactly an innocent piggy-back ride, but this is a family-friendly blog!) They almost cooperated. One bird was hopping onto the back of the other bird, when the second bird decided that she wasn’t interested and scooted away. The top bird was left flapping his wings and running after his mate. One of these days I’m going to get that shot!! 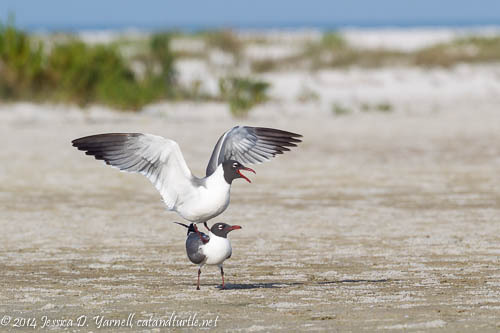 So my consolation prize was this Laughing Gull pair, who definitely did sound as if they were laughing during their entire piggy-back ride. The gulls do this pretty commonly on the beach at this time of year, but I was excited to get a nice uncluttered shot with a beautiful Fort De Soto beach background. Even my 1D camera’s buffer filled as this pair danced in front of me! 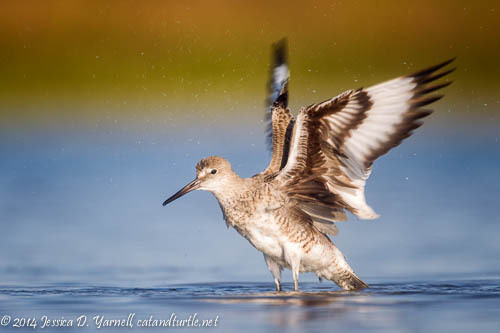 One of my favorite shots of the morning was of Florida’s most common beach birds, the Willet. These drab-looking shorebirds are so easy to find feeding in the surf. I usually don’t stop to take many pictures of them, but when this one started bathing right in front of me, I couldn’t resist snapping the shutter. As I waded and enjoyed the great Florida springtime weather (yep, it’ll last about two weeks and then be sweltering hot! 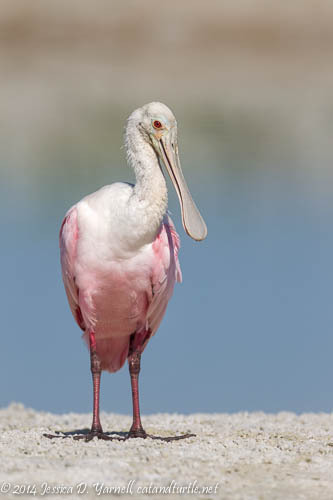 ), this Roseate Spoonbill flew in. She fed quietly in the lagoon for most of the morning, and as I left, she posed prettily in front of the cool blue water. What a great way to end a great springtime bird photography trip to Fort De Soto! I look forward to going back over there later in the month to try for more migrants. ⟵Out of the Egg: I Saw a Sandhill Crane Hatch!! !